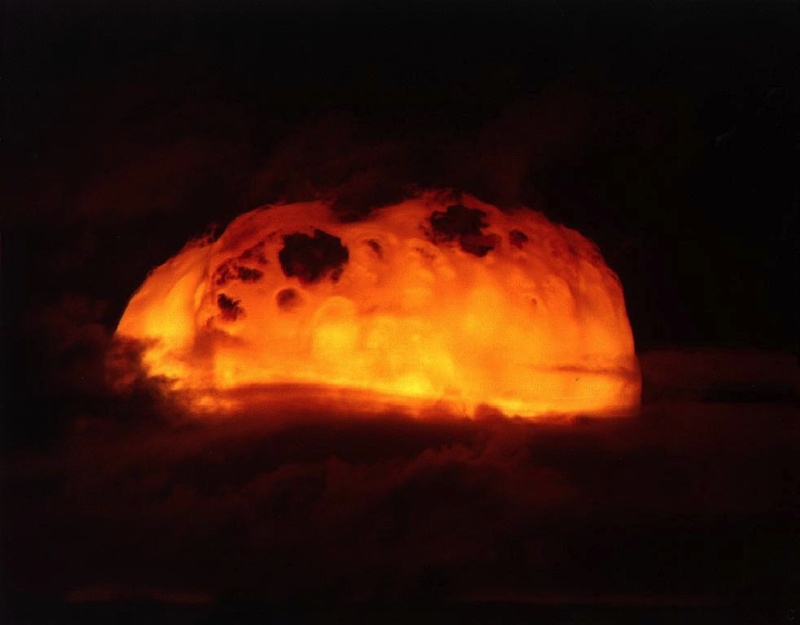 Nuclear Explosions – “The effects could well be called unprecedented, magnificent, beautiful, stupendous and terrifying. No man-made phenomenon of such tremendous power had ever occurred before.” Quote: General Thomas Farrell. Mushroom clouds forms as the center of the explosion is VERY HOT and hot air rises from the middle, pulling up the rest of the explosion (the smoke and debris) from the surrounding area. The middle rises faster because it’s hotter, so it becomes more of a mushroom shaped. 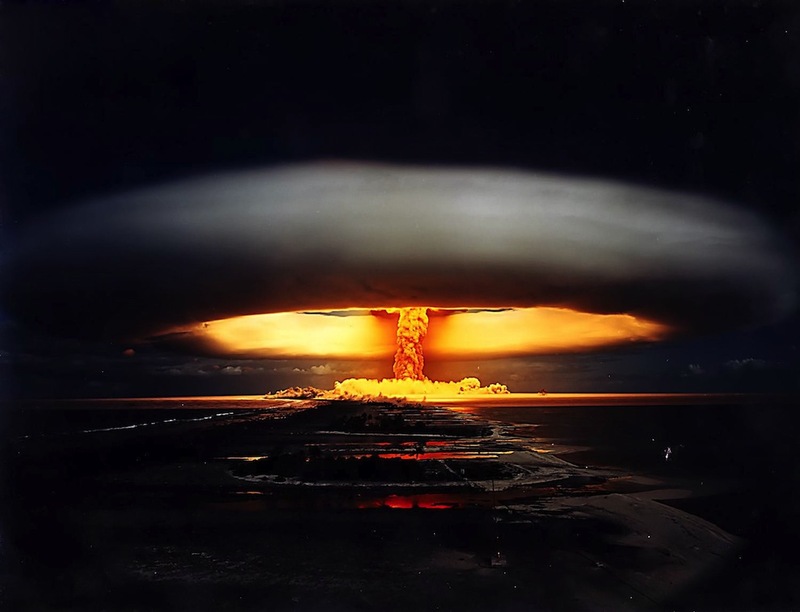 You can never look straight at a nuclear explosions for the same reason you can’t look at the sun. 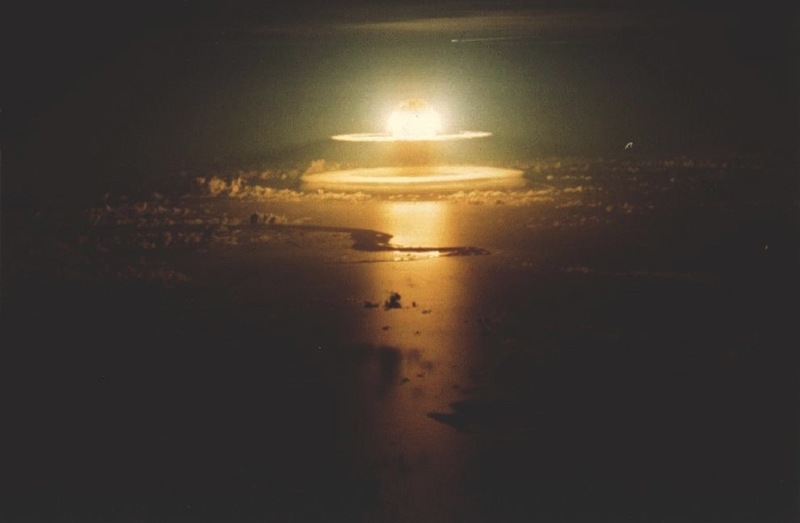 The the momentary flash of a nuke is MUCH brighter than the sun (for a tiny fraction of the second), which will overload your optic nerves. You don’t even have time to blink or turn your head. 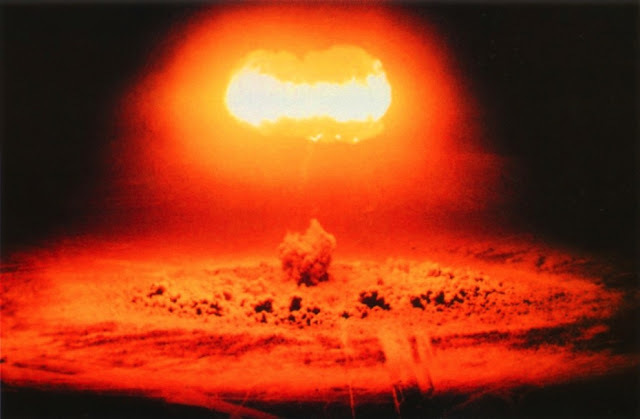 Second test in the Crossroads operation and the 5th nuclear explosion in the mankind’s history. Baker was the continuation of the study of the nuclear weapon effects on the naval vessels and personnel. The bomb has been encased in a watertight shell and placed beneath the landing ship LSM-60. LSM-60 itself has been placed approximately in the center of the target fleet which consisted of 71 vessels. Closest to the device was the aircraft Carrier USS Saratoga. 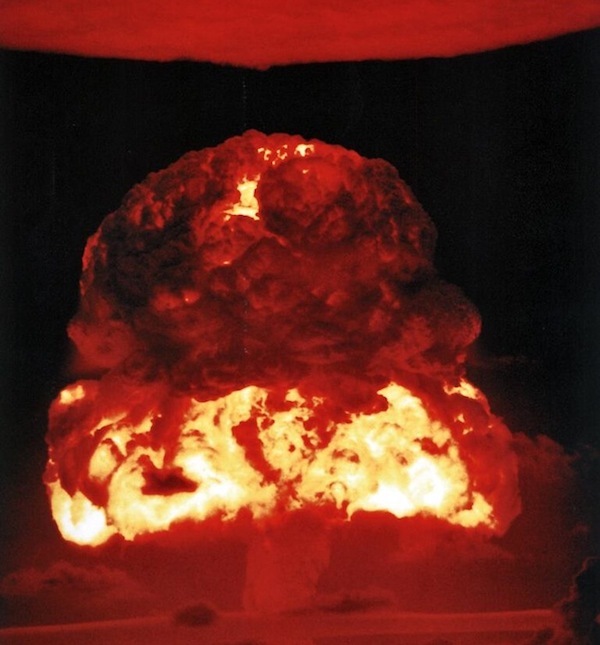 To study the effects of the heat, blast and radiation numerous lab. animals, plants and even biological warfare agents were brought in and placed on the target ships. Eight ships were sunk or capsized: USS Saratoga, USS Arkansas, the submarines USS Apogon and USS Pilotfish, the Nagato, LSM-60, the concrete dry dock ARDC-13, and the barge YO-160. Eight more vessels were severely damaged. 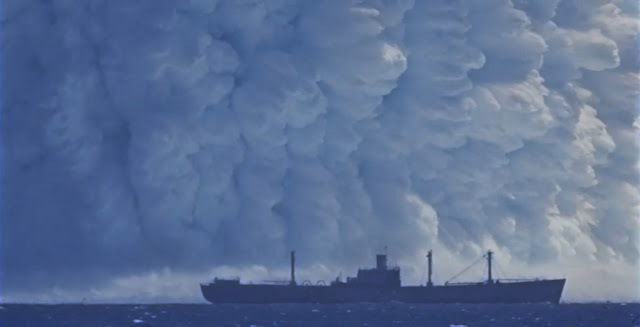 The explosion lifted several million tons of water in the air. 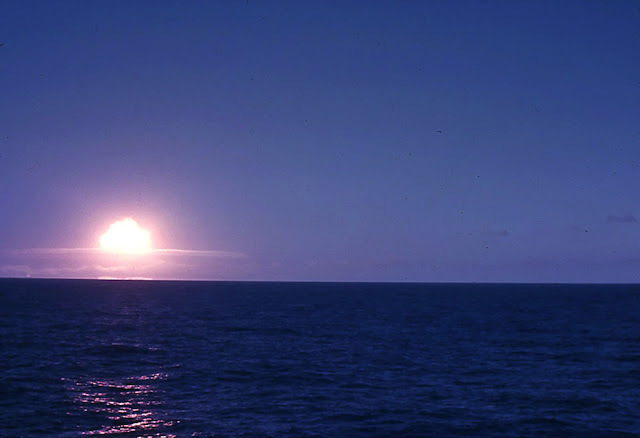 In its apogee the water column was 2000ft(600m) high with walls 300ft(100m) thick. Obviously the explosion generated huge waves in the ocean. Aircraft carrier USS Saratoga’s stern was rising 43ft(13.5m)! above the surface, on the crest of the first wave. The entire lagoon has been contaminated with radioactive particles. 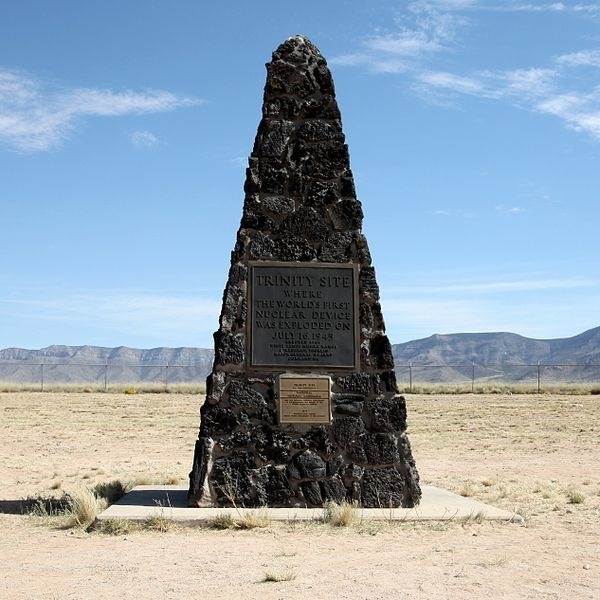 Matter of fact, for the first 24 hours after Baker detonation the radiation levels were lethal, and remained very dangerous for the next week. Originally Romeo test was the 6th in the Operation Castle schedule. However, extremely successful Bravo test changed the schedule, and Romeo has been moved to second position. 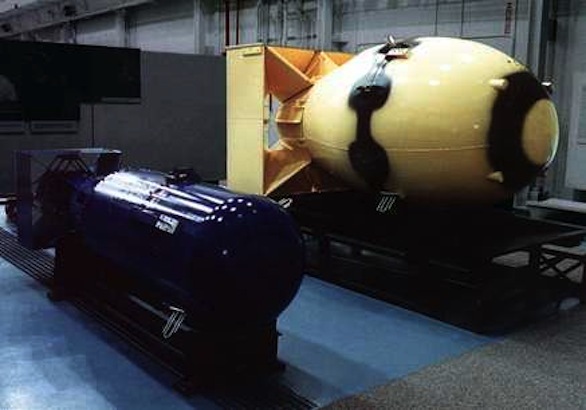 The device used in the Romeo test, Runt I, was a larger version of the device used in Bravo test. It measured 224.9 inches in length, and had a diameter of 61.4 vs. 179.5×53.9 in Bravo device. The difference was in the fuel. Runt I used inexpensive, unenriched Lithium (7.5% Li6 isotope) deuteride. Original yield projection was 4 mgt, with the range of 1.5Mgt-7Mgt. As you can see no one was certain how this device would work. Mainly it was an experiment to see if the cheap thermonuclear fuel would work. After Bravo test the projected yield has been doubled, 8Mgt, and the maximum yield increased to 15 Mgt. The explosion yielded 11 Mgt. Hence, it was almost 3 times higher than the original prediction. Romeo was the first US nuclear test conducted on the barge. 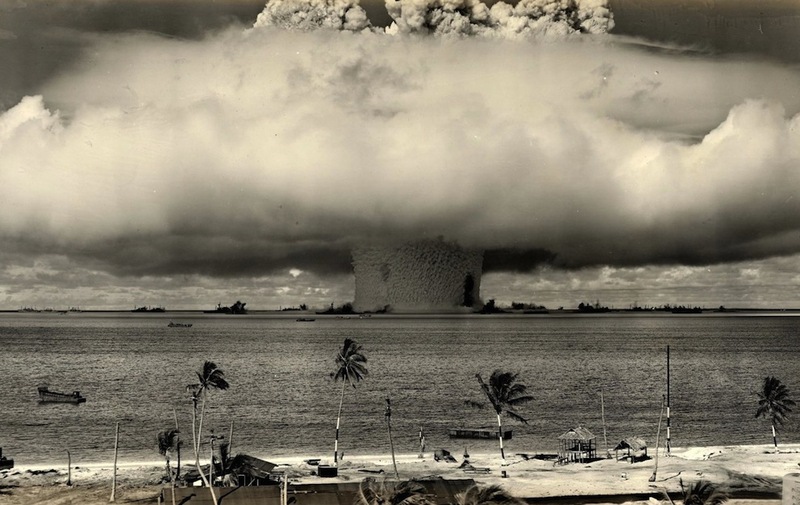 Considering that multi-megaton explosions were practically costing an island per explosion, there were no other choices. For the reference, the Romeo barge has been anchored in the Bravo crater. The AZTEC detonated 27. 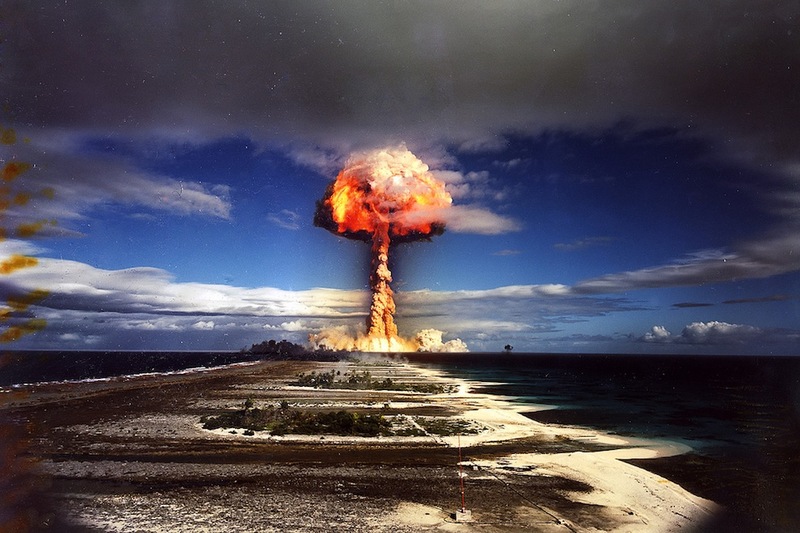 April 1962 on Christmas Island, It was a 410 kiloton Nuclear Bomb. RANGER Operation – 1951 – Photograph of detonation; specific test not identified. 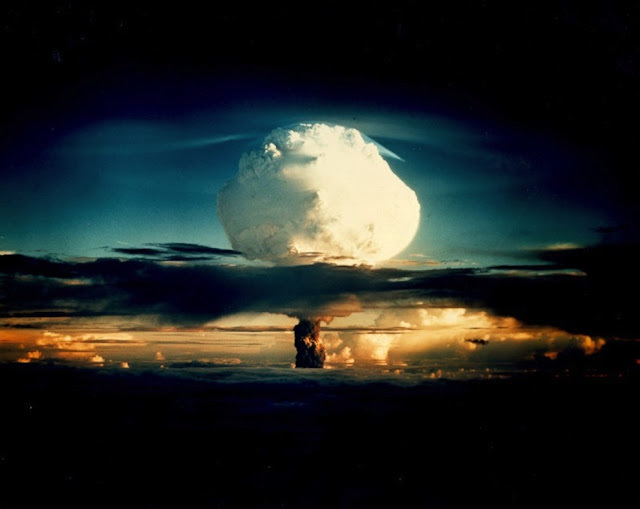 Trinity was the code name of the first nuclear weapons test of an atomic bomb. 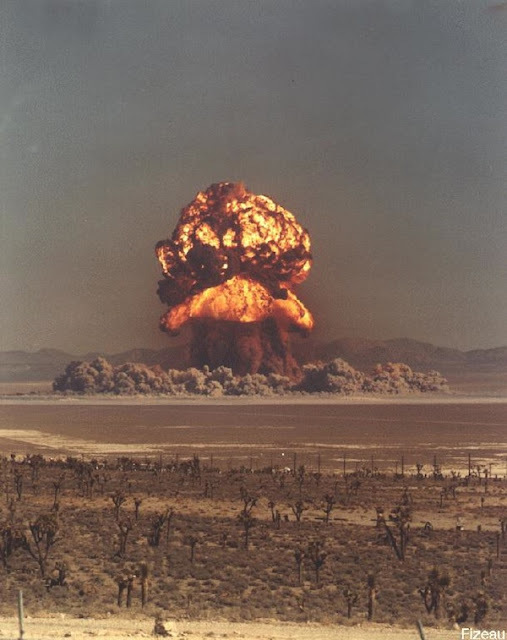 This test was conducted by the United States Army on July 16, 1945, at a location about 35 miles (56 km) southeast of Socorro, New Mexico, at the White Sands Proving Ground, Trinity was a test of an implosion-design plutonium device. The weapon’s informal nickname was “The Gadget”. 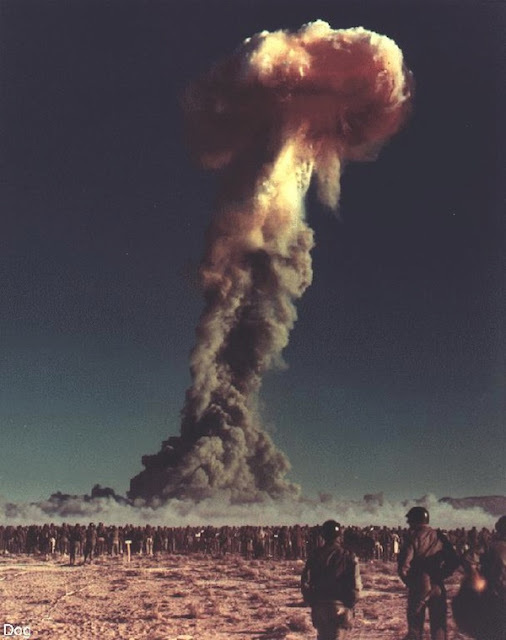 The Trinity detonation produced an explosive power equivalent to the explosion of about 20 kilotons of TNT. 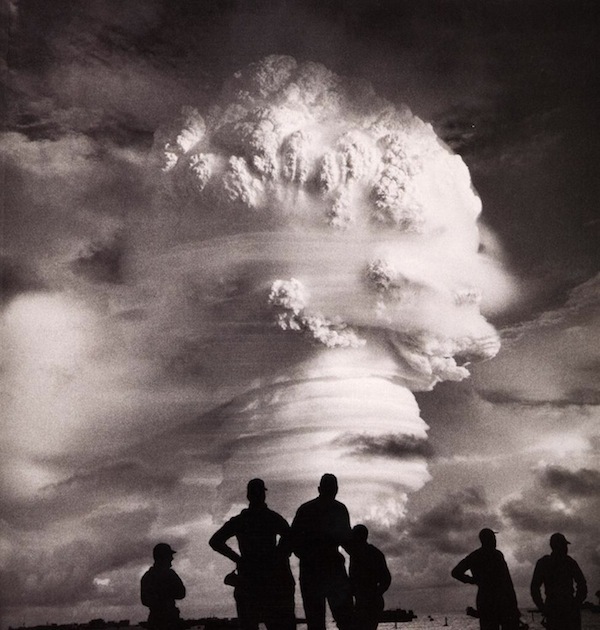 This date is usually considered to be the beginning of the Atomic Age. 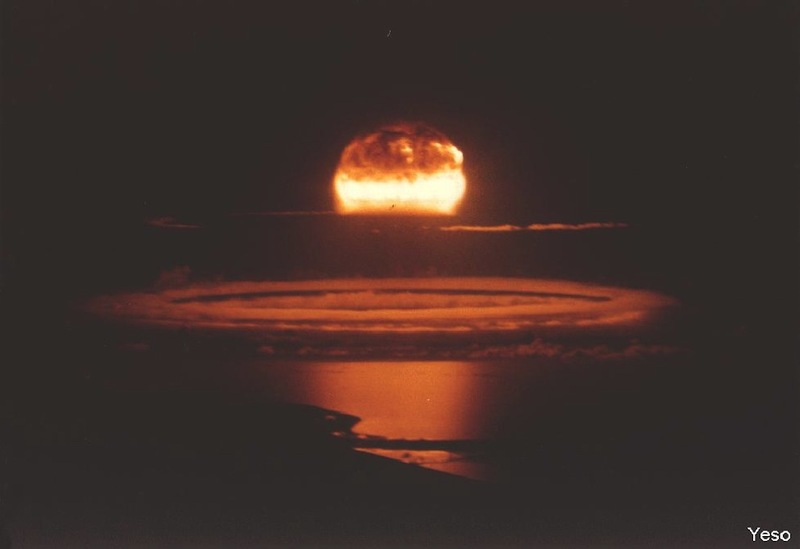 Castle Bravo was the code name given to the first U.S. test of a dry fuel thermonuclear hydrogen bomb device, detonated on March 1, 1954 at Bikini Atoll, Marshall Islands, as the first test of Operation Castle. 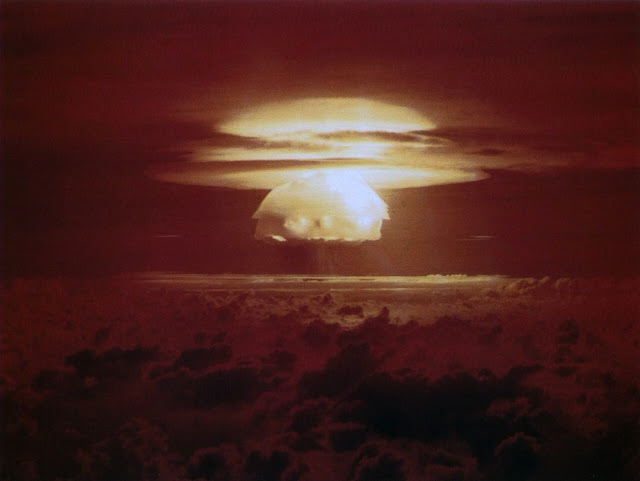 Castle Bravo was the most powerful nuclear device ever detonated by the United States, with a yield of 15 megatons. 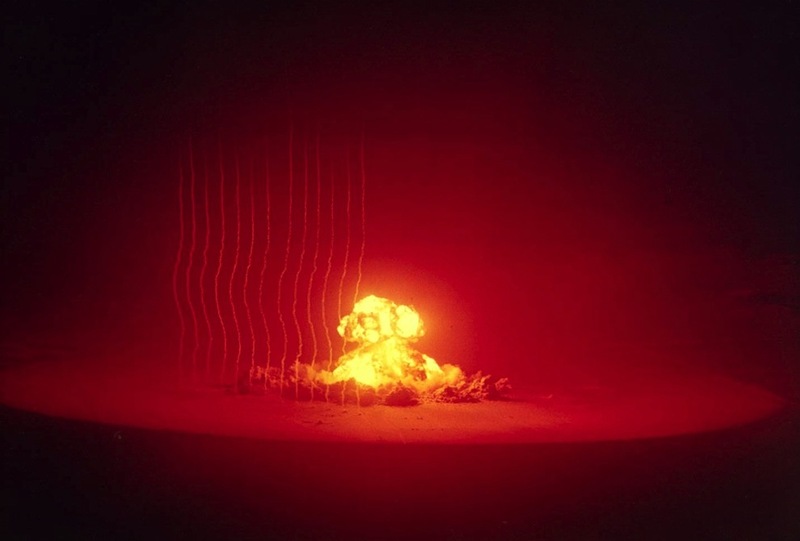 That yield, far exceeding the expected yield of 4 to 6 megatons, combined with other factors, led to the most significant accidental radiological contamination ever caused by the United States. 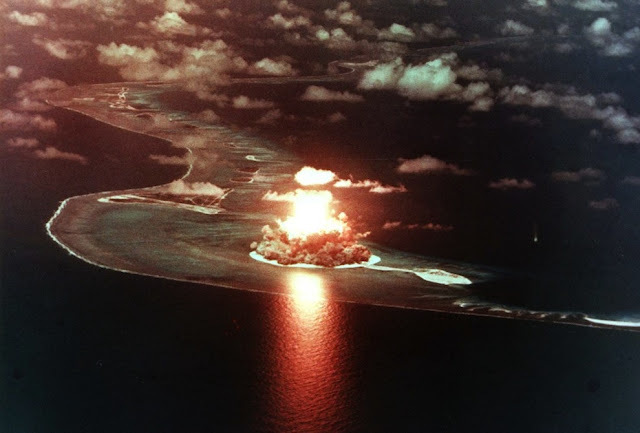 Fallout from the detonation — intended to be a secret test — poisoned the islanders who had previously inhabited the atoll and returned there afterwards, as well as the crew of Daigo Fukuryū Maru (“Lucky Dragon No. 5″), a Japanese fishing boat, and created international concern about atmospheric thermonuclear testing. Location: Johnston Island. Date: 18.Oct.1962. 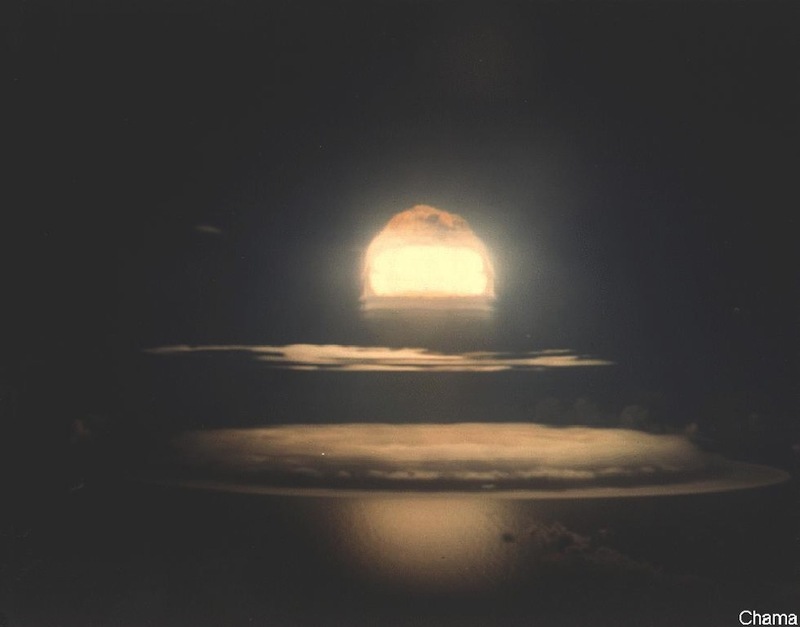 Operation Upshot-Knothole, ANNIE EVENT – a tower event conducted on 17 March 1953. 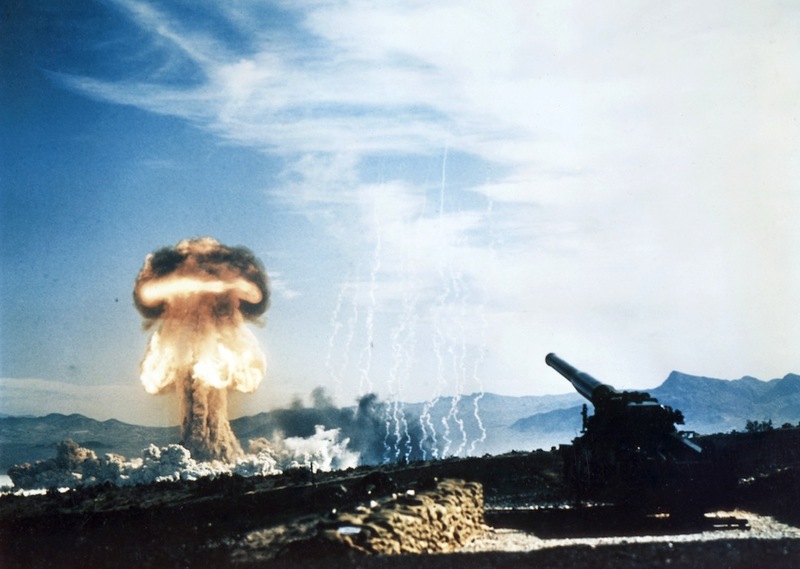 Oak was a test of prototype device for TX-46 system designed in Los Alamos. 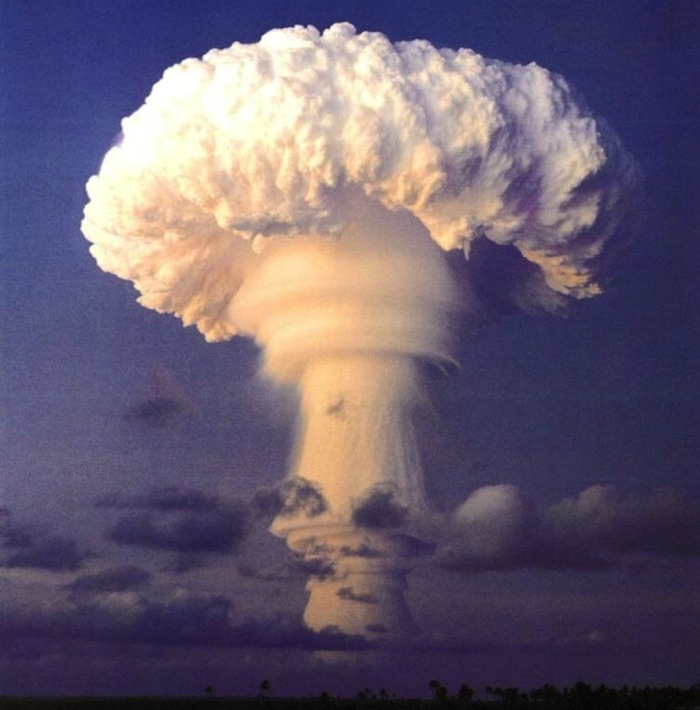 A 8.9 Mgt detonation. 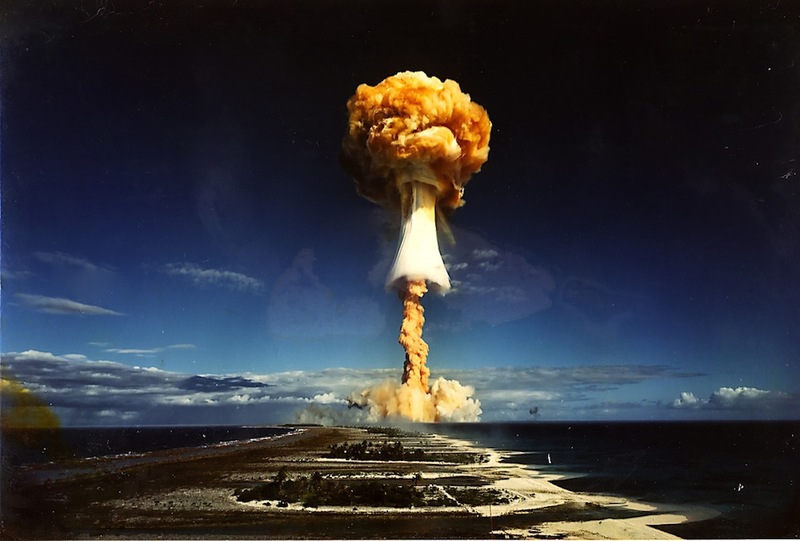 Oak became 6th largest nuclear detonation even conducted by US. 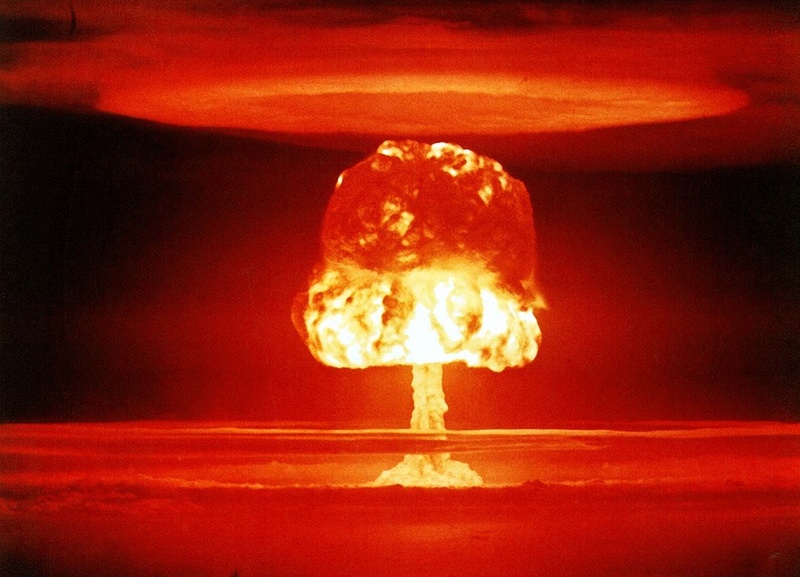 The device called Sausage, detonated in the Mike test was the first true thermonuclear bomb ever tested. However, the Sausage was not a deliverable weapon. It was an enormous, complex device, 80 inches wide and 244 inches long. The entire assembly weighted 82 metric tons. The explosion yielded 10.4 Mgt. Mike’s fireball measured 3 miles. The cloud formed by Mike shot was immense. Stabilized, it reached 135 000 ft high, and stretched 60 miles in diameter, which eventually spread over 1000 miles. Mike destroyed the entire Elugelab island. The crater formed as a result of the explosion measured 6240ft(1.5Km) across and 164ft(53m) deep. Following the test, high levels of radiation covered most of the Enwetak atoll. 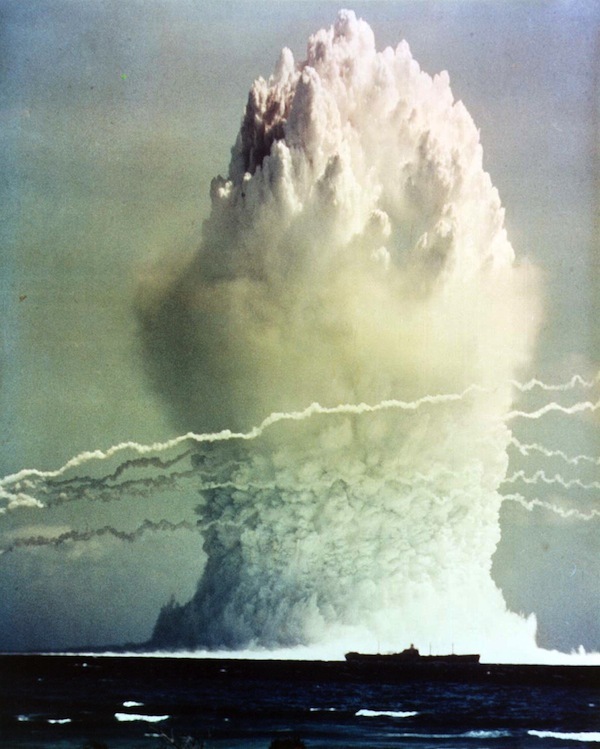 This was 4th largest test ever conducted by US, (the largest at that time). For comparison, this is more then all allied bombs dropped during WW II together. 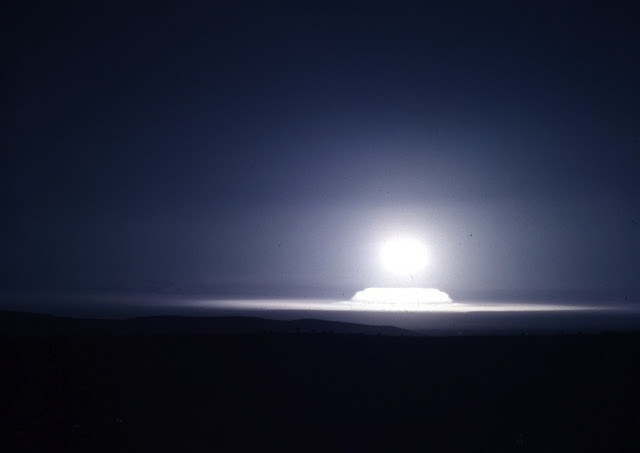 Romeo was the first US nuclear test conducted on the barge. Considering that multi-megaton explosions were practically costing an island per explosion, there were no other choices. Operation : Upshot, Review : Annie, Location : Knothole, Nevada Test Site, Area 4, Load : 16 kt. 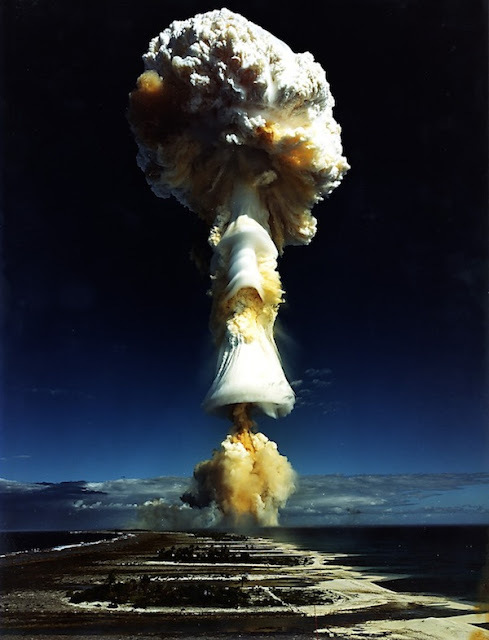 Picture of an atmospheric nuclear test in French Polynesia, August 1971. 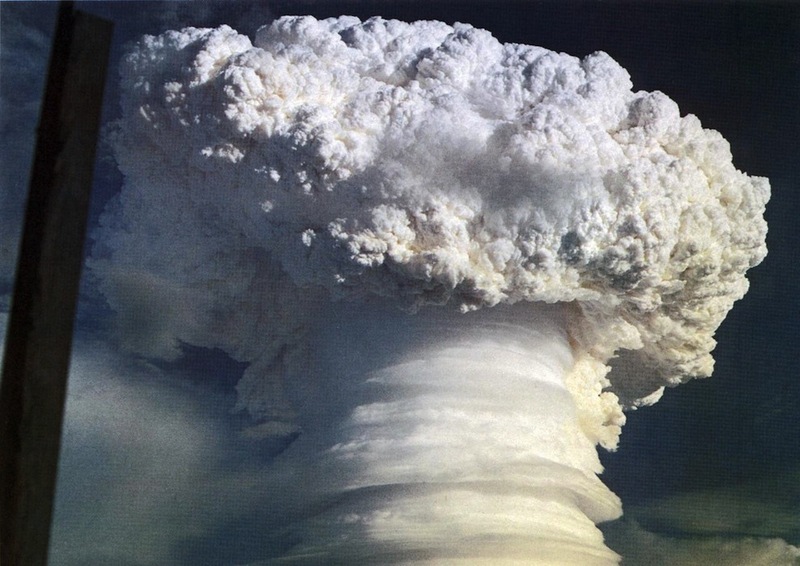 The test took place on the 14th August, 1971, was a thermonuclear warhead codenamed Rhéa and yielded 1000 kt. 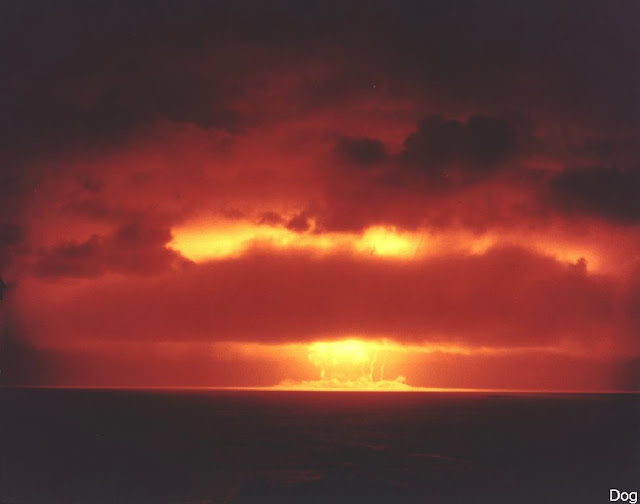 It took place in Moruroa, and the picture was taken at about 60 km from ground zero. 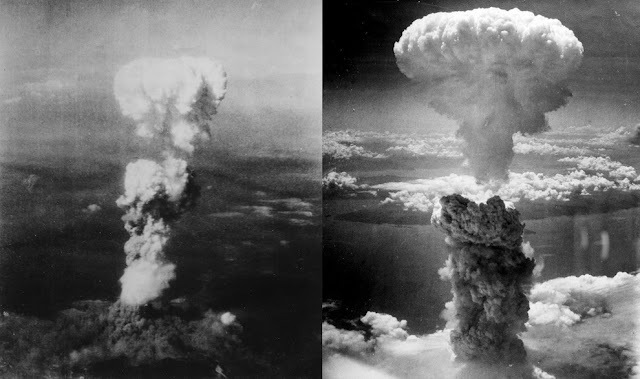 Atomic bomb mushroom clouds over Hiroshima (left) and Nagasaki (right), During the final stages of World War II in 1945, the United States conducted two atomic bombings against the cities of Hiroshima and Nagasaki in Japan, the first on August 6, 1945 and the second on August 9, 1945. These two events are the only active deployments of nuclear weapons in war to date. 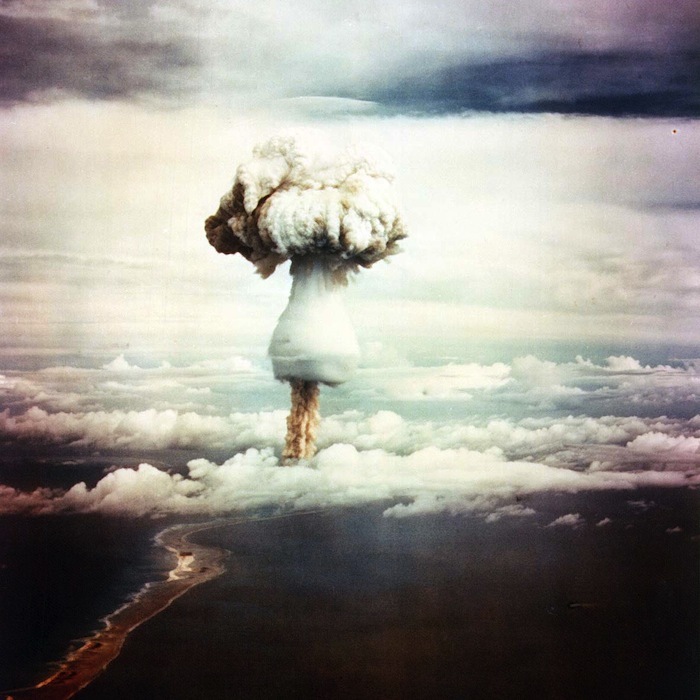 By executive order of President Harry S. Truman, the U.S. dropped the nuclear weapon “Little Boy” on the city of Hiroshima on Monday, August 6, 1945, followed by the detonation of “Fat Man” over Nagasaki on August 9. Within the first two to four months of the bombings, the acute effects killed 90,000–166,000 people in Hiroshima and 60,000–80,000 in Nagasaki. 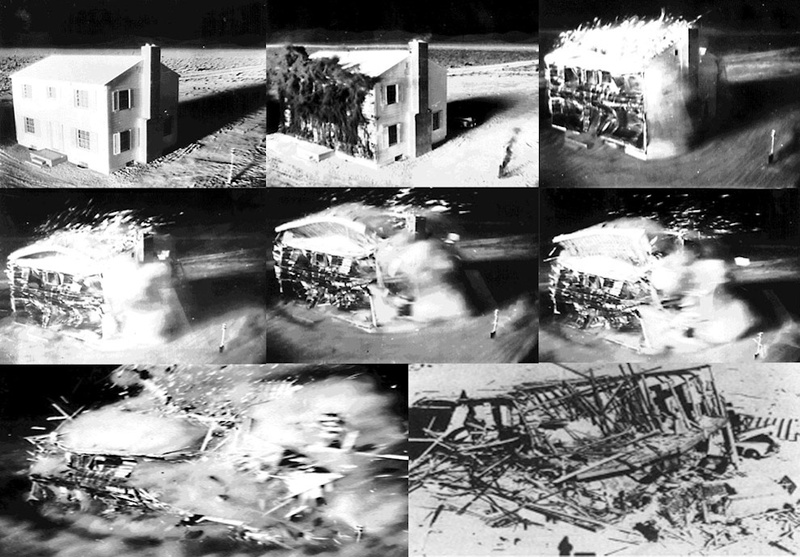 Nevada Proving Ground – Complete destruction of House No. 1 located 3,500 feet from ground zero, by the March 17, 1953 atom blast at Yucca Flat. The time from the first to last picture was 21/3 seconds. 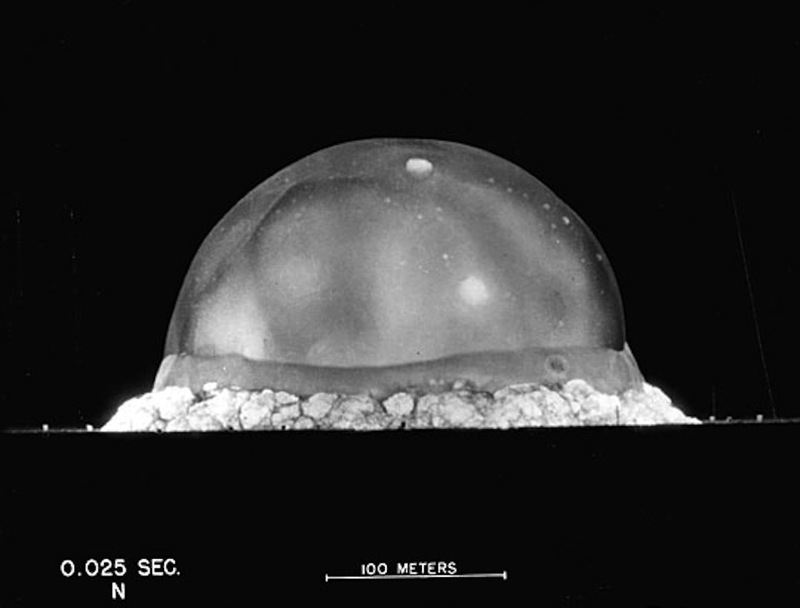 The camera was completely enclosed in a 2-inch lead sheath as a protection against radiation. The only source of light was that from the bomb.